For over 150 years, Winchester has been providing some of the best ammunition in the United States. As one of the most influential manufacturers in the country, Winchester has a reputation that is hard to rival. 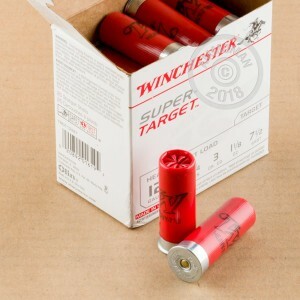 When you plop these beauties into your shotgun, you can feel secure in the fact that Winchester has your back. 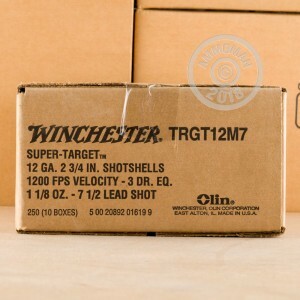 The 12 gauge, as the most popular shotgun in the states, has great power, wieldability, and can put out a lot of lead. 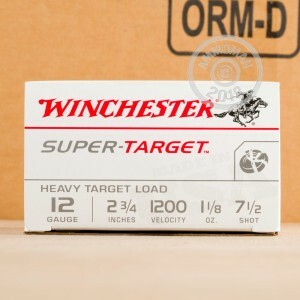 With these Winchester Super Target, #7 1/2 shot rounds, you are set for the time of your life out at the range shooting clays. 2 3/4" of 1 1/8 ounce, #7 1/2 shot pellets will get you through the day without missing a shot. This stuff is great to take out to the range and blast clays with. Great price on good shot!